What conditions does Plavix treat? Easy bleeding/bruising, stomach upset/pain, diarrhea, and constipation may occur. If any of these effects persist or worsen, tell your doctor or pharmacist promptly. Although unlikely, serious bleeding in the stomach, gut, eyes, or brain may occur. Also, clopidogrel can rarely cause a very serious blood disorder (thrombotic thrombocytopenic purpura-TTP). Symptoms may appear any time after starting this medication. Get medical help right away if any of these symptoms occur: severe stomach/abdominal pain, uncontrolled bleeding from gums or nose, bloody/black stools, confusion, fever, extreme skin paleness, purple skin patches, fainting, fast heartbeat, sudden severe headache, unusual weakness/tiredness, vomit with blood or that looks like coffee grounds, slurred speech, vision changes, seizures, yellowing eyes/skin, bloody/red/pink/dark urine, signs of kidney problems (such as change in the amount of urine). List Plavix side effects by likelihood and severity. What should I know regarding pregnancy, nursing and administering Plavix to children or the elderly? A product that may interact with this drug is: tipranavir. If you are currently taking aspirin, consult your doctor promptly and ask whether to continue or stop taking it with this medication for your specific condition (aspirin and clopidogrel may be used in combination after a coronary stent procedure, or for some heart conditions). If you are not currently taking aspirin, consult your doctor before starting it for any medical condition. Other medications can affect the removal of clopidogrel from your body, which may affect how clopidogrel works. Examples include certain acid reducers (proton pump inhibitors/PPIs such as omeprazole, esomeprazole), fluvoxamine, fluoxetine, cimetidine, fluconazole, ketoconazole, voriconazole, etravirine, felbamate, and ticlopidine, among others. Promptly ask your doctor or pharmacist for more details. Clopidogrel can slow down the removal of other drugs from your body, which may affect how they work. Examples of affected drugs include dasabuvir, repaglinide, among others. Check all prescription and nonprescription medicine labels carefully since many medications contain pain relievers/fever reducers (NSAIDs such as ibuprofen, naproxen, or aspirin). These drugs may increase the risk of bleeding/antiplatelet effect when used with clopidogrel. Ask your pharmacist about using these products safely. Does Plavix interact with other medications? Should I avoid certain foods while taking Plavix? Laboratory and/or medical tests (such as complete blood count) may be performed periodically to monitor your progress or check for side effects. Consult your doctor for more details. 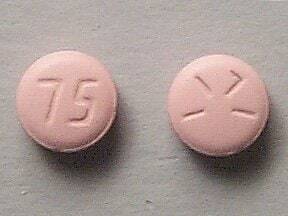 This medicine is a pink, round, film-coated, tablet imprinted with "75" and "1171". Are you considering switching to Plavix? How long have you been taking Plavix?